A Magazine of Modern Thought for Mental and Physical Development / Master-Thought or the Thought That Matters / Universal Philosophy, Sociology, Religion, Science, Cultivation of the Higher Senses and the Development of Body, Mind and Soul. Chicago, IL, then Los Angeles, CA, then Lowell, MA; then Encinitas, CA. 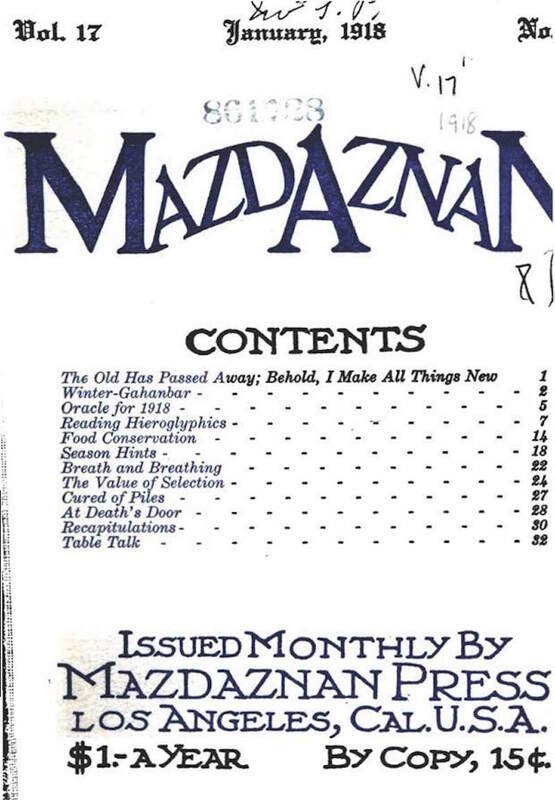 Publisher: Mazdaznan Publishing Co.; Mazdaznan Association; Mazdaznan Press; The Household of Mazda. Editor: Orlando G. Beeler (1920s). 2/1, January 1903-current. 32-48 pp., $1.00 a year. Volume numbering continues that of The Sun-Worshiper. Called Mazdaznan and the Messenger, 1913-1914. This propagates the teachings of Otoman Zar-Adusht Ha'nish, and was largely written by him. Notable is the original version of what became Anyahita. On him see the note under The Sun-Worshiper. The journal served as the advertising medium for Ha'nish's various diet and beauty concoctions and for his books. NYPL microfilm; Association of Research Libraries; University of Illinois; NY Historical Society; California State Library; Stanford University; Harvard University; Universiteitsbibliotheek; Marymount University; etc.